Get clear and informative answers to the garage door repair questions you've always wanted to ask. For answers to some of the most interesting garage door questions, check out our FAQ page. You will find plenty of useful information and advice. Click here to get started. Is it easy to lubricate the mechanical parts? Lubrication maintenance is extremely significant and you need to make sure you are using the right lubricants. The job would be easier if you get lubricants in the form of spray but you need to use the right proportion. For best results you must carefully read the manual of the manufacturer about garage door maintenance methods because if you do something wrong, the mechanical garage door parts won't work efficiently. Why should I buy wooden garage doors? It is not a coincidence that wood garage doors have survived the ages and although new materials conquered the markets and frequent garage door service is needed, wood is still the number one preference of most consumers. Wood doors will increase the value of your house and provide sufficient insulation, if your location does not experience severe weather conditions. It is strong and comes out in many colors. When should I change the sensors? Garage door sensor replacement is necessary when they are not working properly or at all. 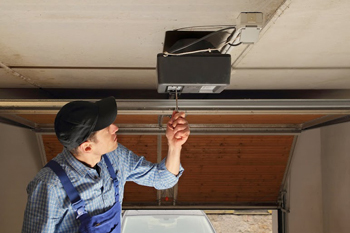 They are the most important garage door parts of the system since they can protect you from accidents or small injuries. It's best to check them as often as possible, examine their wires and align them, so that they can face each other and, thus, sense an obstacle under the closing panel. What sort of batteries does my garage door opener take? Garage door openers often take special battery packs, meaning that your local drug store will probably not have what you’re looking for. While the packaging will often tell you the batteries you need, our team members are happy to help with all inquiries. How do I protect the metal garage door parts from corrosion? When you buy the door, you should confirm that they are galvanized first. For further protection, our experts suggest that you clean them with a solvent and apply lubricant regularly. Parts which have been damaged have to be replaced. Why bottom rollers need more attention? 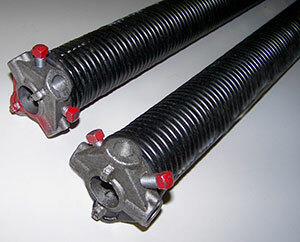 What makes bottom garage door rollers special is the fact that they are attached to the bracket, where the cable is attached, too. So, if you do something wrong like removing the bracket or meddle with the cable, it could snap and injure you. Where do I place c-clamps when I want the door open? It's best to place c-clamps under the bottom rollers. It's also preferable to use c-clamps at both sides of the door for better stability. Garage Door Repair Cloverleaf recommends supporting the door with an extra object (ladder) if the springs are broken. Why are windows set in the top garage door section? This is actually not a mandatory requirement. They can be set in any section depending on the preferences of the client. Still, when they are high above the ground, the maximum possible amount of ambient light can enter the garage. This is also important for the security of the door.